Final Master Plan Conceptual Image. 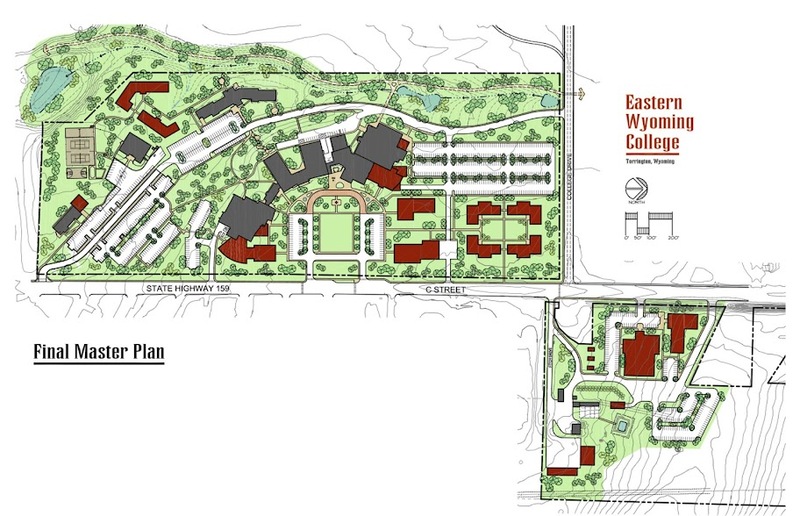 Eastern Wyoming College has recently completed the master planning process. The final report was accepted by the Board of Trustees at their February meeting. The process of completing a master plan is required by the state and must be done every five years. EWC took the opportunity to expand the planning level and looked out over a twenty year period. 1. Organize the campus to strengthen the academic mission. 2. Optimize the efficiency and utilization of the existing buildings, and identify the potential for new facilities and infrastructure to accommodate future programmatic needs. 3. Enhance the sense of place of the College by reinforcing the portals and defining the edges that identify the campus. 4. Improve the pedestrian and vehicular circulation so that access is safer, intuitive, and functional. 5. Define landscaped open spaces and connections to create vibrant settings for socialization, study, and celebration of the College’s culture and heritage. 6. Develop a comprehensive framework to ensure a flexible and enduring future. The Campus Master Plan is the result of collaboration between a number of entities that helped guide its formation including: students, staff, faculty, the Facilities Planning Committee, the Leadership Team, the Board of Trustees, the Foundation, and the Community Advisory Committees. This process spanned over eight months and included on-campus meetings, planning workshops, open forums, and formal presentations. · The Plan carefully evaluated the capacity of the Main and North Campuses and determined that the College has enough land area to meet future growth requirements. While not mandatory, a few surrounding properties could be acquired over time to buffer the edge conditions of the campuses. · The campus core represents the strongest opportunity to exemplify the Master Plan goals of the College. This area of the campus provides several of the best building sites for future programmatic growth, landscaped open space that can transform the sense of place, dramatically improve pedestrian and vehicular circulation, and create new portals into campus that will reinforce the campus edge conditions and improve the perception of first time visitors and the community. · The future of student housing is addressed with the siting of new residence halls in two effective locations that can be phased based on the College’s needs, that is perpetuated by the eventual replacement of Eastern Hall. · The Plan addresses a number of open space opportunities that will benefit the campus community by creating memorable landscaped settings, improving stormwater management controls, and augmenting the College’s sustainable practices. Integrated within these improvements will be a safer and more functional network of pedestrian pathways. This system will connect buildings more efficiently, expand campus circulation, and improve street crossings. · Parking and vehicular circulation received special attention because of the relative importance they play on day to day operations of the College. Parking requirements were met by adding and increasing new parking before any existing were relocated, and by balancing the overall system capacity on sites on both campuses. Vehicular circulation was improved by adding a street to circumnavigate the campus, closing a street through the middle of campus, and adding multiple gateways into both campuses. · The North Campus provides an excellent opportunity to meet the programmatic growth needs of the College in a meaningful and efficient manner. This campus is the site for the planned Agriculture Technology Education Center (ATEC) facility which requires significant adjacent open space and ancillary buildings to accommodate livestock, truck, and trailer parking. In addition, the adjacency of two major programs with complementary requirements. Lastly, the motor pool and bus garage were relocated here in order to maximize the potential for land use on the Main Campus. “Our Eastern Wyoming College Master Plan is the result of a significant investment of time and dollars to ensure the best possible future for students and our community. Planning principles placed priorities on people, programs, and a sense of place. We had extraordinary interest and input from all quarters to develop this framework for future decision making. We are excited to share the vision and the challenge of what we believe is conservative in regard to use of current space, thoughtfully flexible and sequenced projects, and, certainly, detailing affordable and reachable goals over the next twenty years,” shared EWC President Dr. Tom Armstrong. 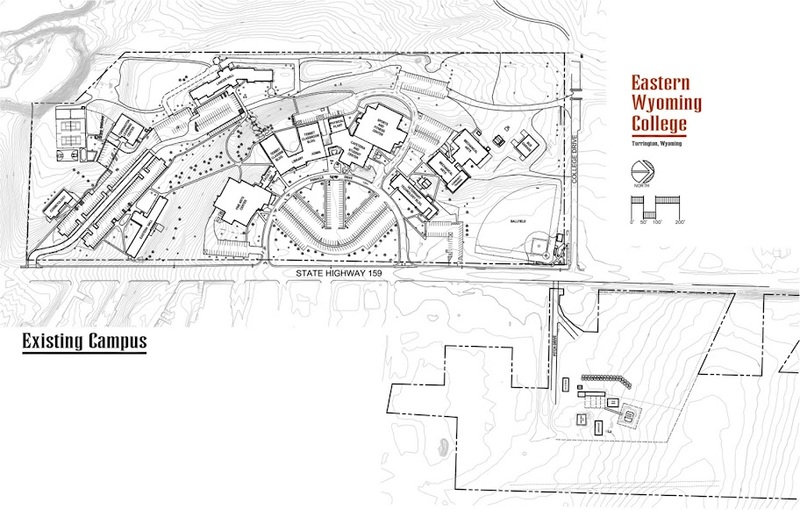 EWC is also forging ahead on a new Eastern Wyoming College campus facility in Douglas. The project is underway as a result of multi-year planning. Financing for the project became secure when the voters of Converse County voted in favor of a special use tax for the facility. Eastern Wyoming College is pleased to announce the honor rolls for the Fall 2012 semester. There were 347 students receiving recognition for achieving high scholastic grades. Eastern Wyoming College would like to announce the recognition of the individuals who were nominated by their peers for the Wyoming Association of Community College Trustees Awards. The nominations were for exemplary student, faculty member, classified employee, professional employee and Foundation volunteer award. Nomination packets included examples of how the nominee has had a positive impact on their community college and how they have been involved in the community. Nominees were recently recognized at an Awards Ceremony and Legislative Reception held in Cheyenne. Don Snyder, Grounds Assistant was the nominee and winner of the Classified Employee of the Year award. It is not uncommon to find Don at the College at 3:00 am clearing snow for all of the students and employees who will be soon arriving. Whether he is working on equipment or replacing a sprinkler head, he makes sure the job is done right. The nominee and winner for Foundation Volunteer of the Year was Patrick Korell. He has served on the Eastern Wyoming College Foundation Board for twelve years and seven of those years he has served as the President. He has overseen the growth and expansion of the Foundation’s assets from $1.5 million to nearly $7 million. The College has directly benefitted from Patrick’s leadership and connection to the school through his many years of teaching on our campus. The EWC nominee for Student of the Year was Teal Deen. Teal participates in many major activities on the EWC campus and surrounding community. She is Secretary for the Student Senate, President of the Gay/Straight Alliance Organization, Secretary of the Art Club, a member of Phi Theta Kappa (PTK) Honor Society, the EWC Diversity Club and the EWC Diversity Committee. Teal is also a tutor in the Learning Skills Lab, and a tutor at Torrington Middle School. She was intricately involved in the first Ox-fam American Hunger Banquet held on campus. Faculty recognize her as a bright, curious, serious and very enjoyable young woman, with a good attitude toward school and studying. Dr. Peggy Knittel was nominated as the Faculty Member of the Year and is a long-term science faculty member at Eastern Wyoming College. Dr. K (as her students affectionately call her) is an amazing and dedicated instructor who helps students become better equipped to take the next steps in their educational pathway. Student comments include heartfelt remarks like “Greatest biology instructor I’ve ever had. I learned more than I have in any other class.” “Dr. K is FABULOUS! Love her! I would like all my medical classes to be taught by her.” She encourages students to develop good study habits and attain their goals at the highest levels possible. Peggy has received the gratitude of many such students who are now nurses, medical technicians, science instructors, or perhaps just community college students who learned a little bit more about science from an instructor who took the time and effort to help them along the way. EWC’s nominee for Professional Employee of the Year was Tami Afdahl , College Relations Director. She has been an asset to EWC in a number of roles. Starting her career at the College as an effective recruiter, she was committed to Lancer pride and continues to “wear the black and gold” in all she does. Ms. Afdahl recently planned, coordinated and directed the marketing and advertising campaign to encourage Converse County voters to vote in support of the special purpose tax. On November 6, the Converse County voters supported the 1% Special Purpose Tax for the new EWC Douglas Branch campus building. She possesses outstanding marketing and public relations skills, strong leadership skills with high standards of personal integrity, she has the ability to empower people, be a direction setter and a strong communicator. Eastern Wyoming College was also the hosting college of the Awards Ceremony and Legislative Reception recently held in Cheyenne. This event is held annually, hosted by one of the seven Wyoming Community Colleges and the Wyoming Association of Community College Trustees. Completing the Free Application for Federal Student Aid is a vital step in getting help to pay for college. By attending FAFSA Frenzy on February 17th students and families can get free, expert help in filling out this important form. FAFSA Frenzy will have two sessions, one from 1-3 p.m. and 6 – 8 pm February 17th at Eastern Wyoming College in Torrington. Financial-aid professionals — primarily from Wyoming postsecondary institutions — will provide assistance in completing the FAFSA. College-bound students must complete the FAFSA to qualify for federal and state financial aid, as well as scholarships and grants offered by many colleges, universities and vocational/technical schools. Students 23 years of age or younger should attend the FAFSA Frenzy with their parents or guardians and bring their parents’ and their own completed 2011 or 2012 Internal Revenue Service 1040 tax returns, if available, or W-2 Forms or other 2011 or 2012 income, asset and benefits information. If parents cannot attend, students may attend alone, but they must bring the same income information. Students 24 years of age or older may attend and bring their own completed 2011 or 2012 IRS 1040 tax returns, if available, or W-2 Forms or other 2012 income, asset and benefits information. Everything else — including pens, pencils, FAFSAs and snacks — will be provided. This event is free and open to anyone seeking assistance with the FAFSA. This year’s event will feature booths highlighting Scholarships, GI Veterans Benefits, University of Wyoming and 4-year transfers, Work-study, and Gear-Up. For more information about the FAFSA Frenzy, call 307.532.8327. The Community Education office at Eastern Wyoming College in Torrington is now accepting enrollments for the following workshops and classes. Saturday Yoga Workshop will be held on February 23, 2013, 9 am to 12 pm. This great workshop will be taught by Terri Cochran and held in the EWC Fine Arts Dance Room #47. The cost of this workshop is $15. Raised Garden Box Construction Workshops – this will be a hands-on learning experience in building raised bed garden box construction while helping EWC “furnish” the three high tunnel green houses on the North Campus. The $15 fee for this workshop covers the cost of lunch and other refreshments. Workshop dates are February 23, 9 am – 4 pm and March 2, 9 am – 4 pm. Molly Brown Experience bus trip #2 – take an afternoon tour of the Molly Brown House Museum in Denver, a house built in the 1880’s and saved from demolition in 1970. Then spend the evening being musically entertained by a lively production of the Unsinkable Molly Brown at the Candlelight Dinner Theatre in Johnstown, CO. This trip is on Saturday, March 9, 10 am – 10 pm. The cost of $69 includes museum fee, ticket, meal, beverage and tip. There are limited tickets available for this trip. Upcoming in April will be Dining with Diabetes – Hands on food preparation. Instructor Chris Pasley will teach this class on Tuesdays, April 23, 30 and May 7, 14 in the EWC Community Training Center. The cost for this class is $15. Eastern Wyoming College invites the community to attend a Senior Citizen Day at the Lancer basketball games on Saturday, February 9, 2013. There will be free admission for all Seniors 60 years and over who attend. The women’s game begins at 3:00 and the men’s game is at 5:00. The Lancers will be playing Lamar Community College. 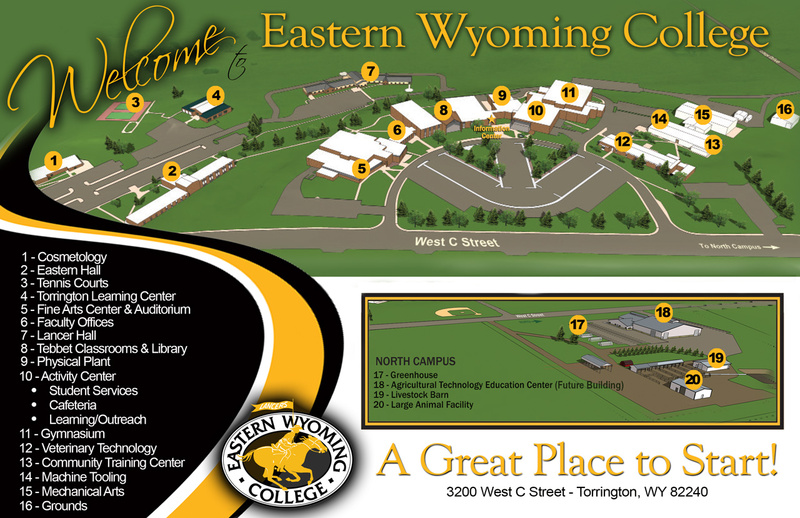 Eastern Wyoming College is hosting Visitation Day on Monday, February 18, 2013. Visitation Day gives students the opportunity to tour the campus. Students can meet with instructors and coaches, visit a class, try out for volleyball. You can also find out more about EWC scholarships, financial aid, and housing. Registration begins at 8:30 a.m. and the sessions run from 9:00 a.m. to 3:00 p.m. with lunch provided. A drawing will be held for a book waiver valued at $250 courtesy of the EWC Foundation. For more information please contact Zach Smith at 307.532.8232. You can also register online. FAFSA Frenzy, a financial aid event will take place on Sunday February 17, 2013 at 1-3pm and 6-8pm. Financial Aid administrators will be available at each of the locations to assist prospective and current college students and their families complete the Free Application for Federal Student Aid (FAFSA), the first step in securing federal and state financial aid assistance for higher education.